I never thought I would actually write anything on this issue, but somehow, my emotions got a hold on me and I just need to write something down to calm myself. You might have heard of this news, or you might not have heard of it. Either way, you should know about it. A simple ‘Chapel Hill Shooting’ search on Google will give you tons of news reports and articles on what happened, where three innocent Muslims were shot in the head over what was said to be a ‘dispute over parking’, but might be a case of hate against the Muslims. “I’ve received numerous questions on Ask.fm asking me if the Islamophobia is really bad here in the US, or if my friends and I have been targets of anything or if anyone has ever said or done anything to us. My answers to those questions have always been no. I haven’t had any bad experiences, but I do know some of my friends who encountered some cases over the winter break, especially after the Charlie Hebdo case. But since I have not personally had any experiences first hand with anything like that, I wasn’t worried much. 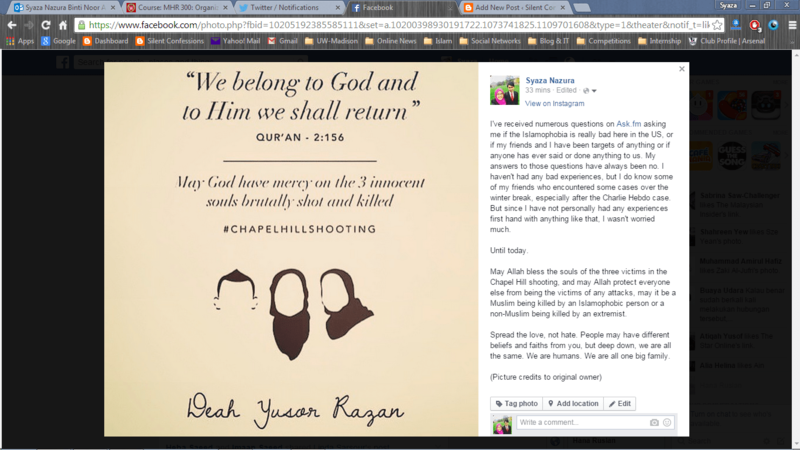 May Allah bless the souls of the three victims in the Chapel Hill shooting, and may Allah protect everyone else from being the victims of any attacks, may it be a Muslim being killed by an Islamophobic person or a non-Muslim being killed by an extremist. Spread the love, not hate. People may have different beliefs and faiths from you, but deep down, we are all the same. We are humans. We are all one big family. It’s not that I’m insensitive to issues regarding the Muslim world out there, like the Charlie Hebdo issue or anything like that, but I don’t know why, somehow, reading about the Chapel Hill shooting and all, it makes me feel so uneasy and uncomfortable and, I don’t know, I feel so troubled. Not that I know any of the victims personally, of course not. Not that it happened in the area I’m studying at. Not that I have any connections whatsoever with the three victims. But… Somehow… I just… I don’t know. Ya Allah. I do seriously hope that whatever that’s happening around the world, please do make it stop ya Allah. All the hate crimes and threats and killings just have to stop. What is even going around in this world now? Aren’t we all the same? Despite the color of our skin, despite our racial backgrounds or our faiths or our beliefs, despite the clothes we wear, we are all the same, aren’t we? Deep down, we are all human beings. And we are all family. Brothers, sisters, fathers, mothers. We are all one. So why are we hurting one another? Why are we doing this to one another? Allah Knows best, I know. The three victims are in a safer place, they’re in His Hands, His Care, His Love. He will take good care of them, as always. They’re in a better off place than here on Earth. But to think that something like this could happen, that something like this would end their time here on Earth. And, to think that… This could happen to anyone at any time. To me. To my friends studying at various places across the world. Even to my family back home. This can literally happen to anyone I know, for whatever reason. May Allah bless the souls of these three victims, and may Allah protects us all. May Allah protect us, not only from being the victims of such crimes, but also from acting in such ways to other people. InsyaAllah. Previous post	Winter Trip, Part 3. Next post	"I'm not like you, I can't succeed like you do."